Hello sparkly teeth! Colgate Toothpaste Total Advanced Health Toothpaste fights bacteria build-up for up to 12 hours and helps prevent plaque, gingivitis and tartar build-up. It keeps bad breath away and gives complete 12 hour Germ Protection. It is an IDA (Indian Dental Association) accepted toothpaste, recommended by dentists and is India's most trusted No. 1 Anti-Cavity toothpaste for the entire family. 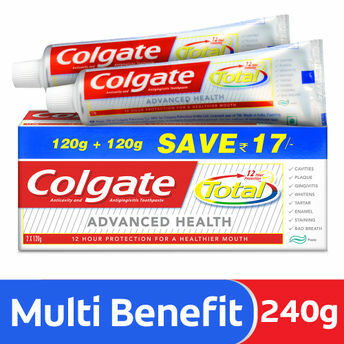 Start your day fresh and healthy with Colgate Toothpaste Total Advanced Health!